Ever seen someone laugh so hard they squirted their drink out of their nose? 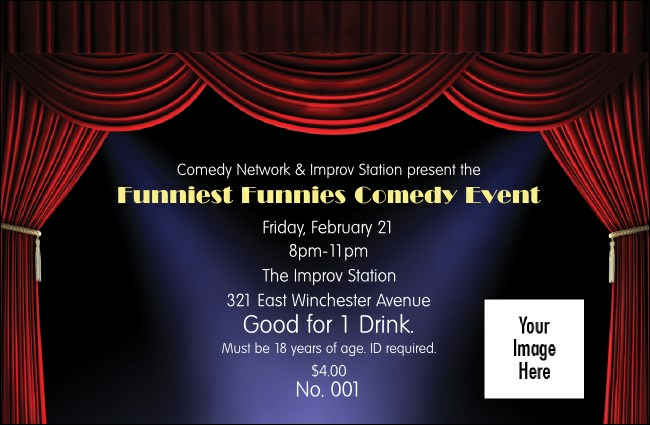 Start tempting fate with a Stand-Up Comedy Drink Ticket for your next comedy get-together. With spotlights and stage curtains and room to upload your logo on the template, this drink ticket helps you sell drinks, reward patrons, and give your bartender a break. From funny to serious, you'll find the right drink tickets at TicketPrinting.com.